GT Food Challenge went GREAT!! 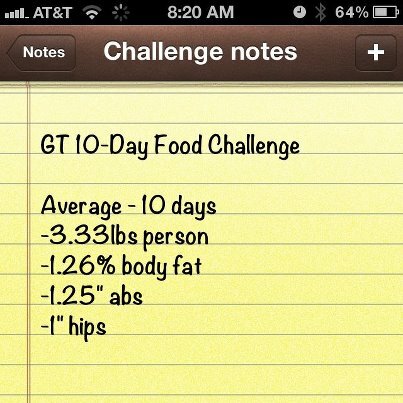 after 10-days average weight loss -3.33lbs & -2.25″ total in Abs and Hips!! We did not recommend a “diet”, everybody ate what they wanted. We did not give out pills or drink powders, our mission with the 10-day Food Challenge was to help teach people accountability and body awareness. Packing around some extra pounds? Some bad habits are hard to break but the first phase of any weight loss program is becoming aware of what and why you eat. Think of the big picture and making little changes along the way that will add up and lead you to a healthy fulfilling life. Monday is no fun, but what about the TGIF’ers? -1lb or more is a WIN!! Be mindful of what your eating on the weekends, its easier to burn 3lbs off when your happy with what you weigh. Had a consultation the other day and I applied the latest research on sugar I learned just days before to a client that had hit a 4wk plateau in weight loss. She lost 8lbs and 6 inches the first 6wks (see video) but didnt lose anything the last 4wks. I looked at her nutrition and made a 300 calorie suggestion on her intake and talked to her about the SUGAR she was consuming in her diet. For her the changes were simple bc I knew where her metabolism was and what the “science” of her body was telling us. 1 week later, 2 days before she leaves for the beach during Fall Break, she messaged me on FaceBook and said that it worked and she is down 4lbs MORE!!! People start new weight loss programs every 4-6 weeks. This video uses examples of weight loss goals I see every day in my studio. People love to please themselves, and they just feel better about starting a new program. Others give it a 110% all or nothing and blow out in 3 wks, yet some feel better by telling people they found a better way. I love to share my goals aloud also, it allows me to alter my short-term goals and stay in line with my long-term focus, although I see his point. The only thing that matters in weight loss is that you continue on a path that allows you immediate success so that you too can focus on the long-term healthy weight goal.